If, like myself, you are lucky enough to still have relatives alive who played a part in the Normandy landings, then this first-hand contact probably offers a richer and more detailed understanding of how those times affected not only them, but the society around them, including the political and economical impacts upon the time period. But to me, this book is still a revelation. James Holland has given a whole new, fresh insight into the stories from history that we thought we understood from school. He has allowed the reader to be able to form their own opinions from evidence and recollections, all pieced together in a sectional time frame, giving a much better understanding of exactly how events developed. Right from the offset, you are embroiled in the complex strategies that were at play. According to Allied intelligence, Normandy would be a far greater operation against a prepared enemy. “Ensuring enough men and materiel were landed quickly enough… before any concentrated enemy counter-attack could be mounted was the absolute number-one priority,” writes the author. Holland has not just covered the British aspect of the war, but all the sides that were involved, no matter how large or small their involvement was. For the first time I found myself looking at this conflict from different perspectives. Equally, Holland puts forward the case that the British were far from the ‘under-prepared amateurs’ so often portrayed in history. 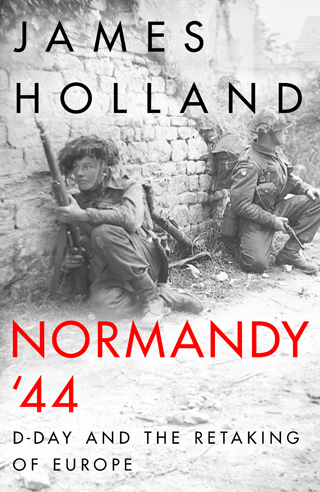 Holland argues that the key to the success of the Normandy campaign was the Allies’ staggering behind-the-lines logistical efforts, which saw the landing of 150,000 troops and large quantities of arms, equipment and supplies, all arriving in unison on the first day. But just as important was the Allied Forces were able to keep the lines of supply coming, and by mid July over a million men had landed, all bringing tanks, ammunition, food until the German forces simply could no longer hold out. This supply of material, alongside the lack of arms supplied to the ‘impenetrable’ German bunkers built above the beaches (their ammunition ran out in just hours) was a major contributing factor to the campaign’s success. Operation Goodwood (the battle and strategy to take Caen, in Normandy) is fascinating, conveyed in such a way that you feel you are almost in the room with planners during discussions. It’s a real testament to Holland’s writing abilities. Here, the psychological differences in the strategical planning between Montgomery and Eisenhower is revealed, and brilliantly examined. If you thought you knew everything you needed to about Normandy ’44, then please think again and read this book. James Holland’s unbiased and balanced approach will offer new insights with a crucial human touch.